Ever since it was announced at San Diego Comic-Con 2016, The Blot has been anxiously awaiting the release of NECA’s Superman vs Muhammad Ali action figure 2 pack based on the artwork of Neal Adams! 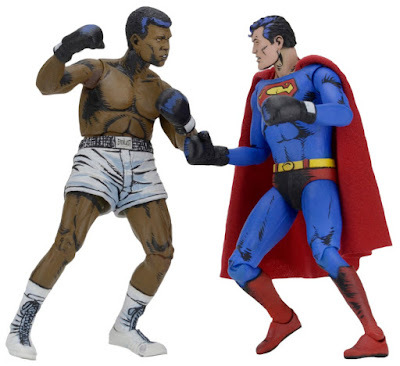 This awesome DC Comics box set, which recreates one of the most famous boxing matches of all time, is finally hitting store shelves later this month. In 1978, legendary boxer Muhammad Ali proved that he truly was “the greatest of all time” by defeating the strongest man on Earth – Superman! Far from a grudge match, this battle in the pages of DC Comics’ historic Superman vs. Muhammad Ali would ultimately set the two up to save the planet from an alien invasion. Now for the first time ever, that iconic team-up comes to action figure form in a stylized set that pays tribute to the philanthropist, social activist and three-time World Heavyweight Champion. 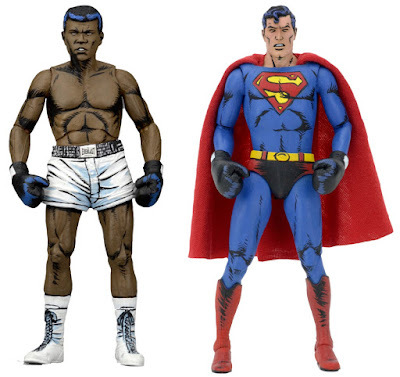 The Superman vs Muhammad Ali DC Comics Box Set by NECA includes two 7” action figures that feature over 25 points of articulation and comic-stylized deco based on Neal Adams’ iconic cover art. Superman also includes alternate ungloved hands. Collectors can purchase this 2 pack now at Entertainment Earth for $39.99 here.